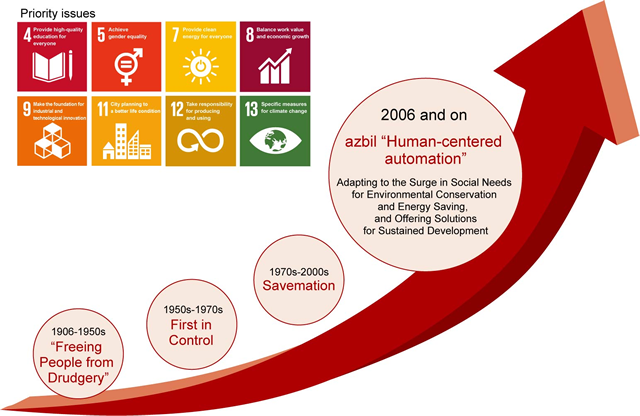 We have cited “human-centered automation,” evolved from the ideas of our founder, as the azbil Group philosophy. By promoting management based on this philosophy, we will continue pursuing Sustainable Development Goals (SDG)-oriented activities. The azbil Group is pursuing various efforts aimed at achieving the SDGs. In addition to conducting energy-saving diagnoses of customer sites, we use various tools to uncover areas of energy wastage. We also measure and analyze energy data of various facilities and compile reports on how to recover investments and the effects of energy savings. As an energy management service provider, we propose methods to drastically reduce capital investments required for energy conservation. As part of increased introduction of renewable energy, meanwhile, we are participating in a virtual power plant demonstration project (Ministry of Economy, Trade and Industry) aimed at fine-tuning a balance between energy demand and supply. Specifically, we are field-testing our automatic demand response system. Through IoT innovation, companies are trying to realize a “super-smart society” that is safer, more efficient, and more comfortable. To achieve this, they must transform their manufacturing facilities into “super-smart factories.” By utilizing big data and AI at manufacturing sites, the azbil Group aims to dramatically improve the operational management of factories and plants using IoT and realize safer, more stable operations. Through industry-leading building automation technology and product lines, for many years we have pursued efficient operational management, energy and cost savings, and enhanced safety and comfort of buildings and facilities. For more than 30 years, we have provided remote monitoring and control services using network technologies, and we now undertake unified management of building facilities covering such areas as air conditioning, electricity, sanitation, and disaster prevention. 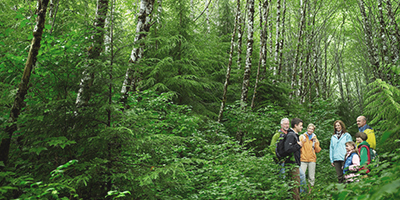 In these ways, we contribute to reductions in life-cycle costs while creating safe, comfortable building environments. In addition to identifying energy conservation issues in buildings, factories, and plants, we propose and implement solutions to them. We also verify the outcomes and provide support for subsequent improvements in order to encourage an upward spiral. In addition, we monitor the amount of CO2 emissions from our business activities and are strategically reducing the environmental impact of our activities through a system in which our internal departments work together. We will use technologies and know-how derived from these efforts to solve further environmental issues. In order to respond flexibly to changes in the business environment, we established the Azbil Academy, a professional organization for human resource development, and are promoting efforts to foster diverse human resources globally. In fiscal 2017, we also cooperated with programs for developing engineers at overseas universities and technical colleges. We define diversity promotion as “respecting each person’s individuality and making use of his/her characteristics to enhance results through motivating work,” and regard diversity as the driving force for corporate growth. In fiscal 2017, we conducted training for female managerial candidates and their supervisors in an effort to create environments where women can excel and also raise awareness among women. As part of our important business management activities that value people, we are pursuing three initiatives: (1) reduction in the total working hours of individual employees; (2) realization of healthy lives, both physically and mentally; and (3) creation of harassment-free workplaces. Through these initiatives, we will create environments where all people can fully demonstrate their abilities and enhance employees’ job satisfaction as we aim for sustainable growth of our company. Furthermore, Azbil Corporation was certified by the Japanese government as a “Health and Productivity Management Organization 2019 (White 500)” for the second consecutive year. We are promoting Design for the Environment based on eight environmental viewpoints that consider the entire life cycles of products and services. We are now implementing “Environmental Design Assessments” that quantify and evaluate the degree of improvement vis-à-vis equivalent products, as well as “Life-Cycle Assessments” to calculate environmental impacts across the entire life cycles of individual products. We conduct reviews of Design for the Environment according to the development stage, and we are making efforts to achieve targets for reducing CO2emissions across the life cycles of each product.